One of the most infamous characters from the Middle Ages was Vlad III Dracula, the prince of Wallachia. Here is the story of how he gained the nickname of ‘the Impaler’. The Histories, by Laonikos Chalkokondyles, which has been recently translated by Anthony Kaldellis, describes the fall of the Byzantine empire and rise of the Ottomans. Written sometime between 1464 and 1468, it centres around the capture of Constantinople in 1453. However, it also covers many events that were happening in Eastern Europe, where the Ottomans, Hungarians and other states were vying with each other. The Ottoman Sultan Mehmet II (1444-46; 1451-81) had supported Vlad II Dracula as Prince of Wallachia. In return, Vlad II sent two of his younger sons Vlad and Radu to live in the Sultan’s court. In 1447, Vlad III and his eldest son were captured and murdered by their own nobles. It would not be until 1456 before Vlad III Dracula was able to return to Wallachia, and with the Sultan’s support, take over the Principality. When he took over, he first created a corps of bodyguards for himself, who lived with him, and then he summoned separately each of the distinguished men of the realm who, it was believed, had committed treason during the transfer of power there. He killed them all by impalement, them and their sons, wives, and servants, so that this one man caused more murder than any other about whom we have been able to learn. In order to solidify his hold on power, they say that in a short time he killed twenty thousand men, women and children. He established good soldiers and bodyguards for his own use, and he granted them the money, property, and other goods of his victims, so that he quickly effected a great change and utterly revolutionized the affairs of Wallachia. He also worked widespread murder among the Hungarians, those who seemed to be involved in public affairs, sparing none of them. But Vlad and his men were armed and, when he joined in escorting the lord of the Porte of that region and the secretary, he fell into the ambush. As soon as Vlad realized what was happening, he ordered his men to arrest them and their servants. And when Hamza came against him, Vlad fought bravely, routed and captured him, and killed a few of those who had fled. After capturing them, he led them all away to be impaled, but first he cut off the men’s limbs. He had Hamza impaled on a higher stake, and he treated their retinues in the same way as their own lords. Immediately after he prepared as large an army as he could and marched directly to the Danube, and crossed through the regions there by the Danube and the land that belonged to the sultan, killing everyone, women and children included. He burned the houses, setting fire wherever he moved. Having worked this great slaughter, he returned back to Wallachia. Unsurprisingly, the Sultan was furious at Vlad’s actions, in particular for killing his officials. According to Chalkokondyles, Mehmet II prepared an army that was second in size to the one he conquered Constantinople with, and crossed the Danube to invade Wallachia. 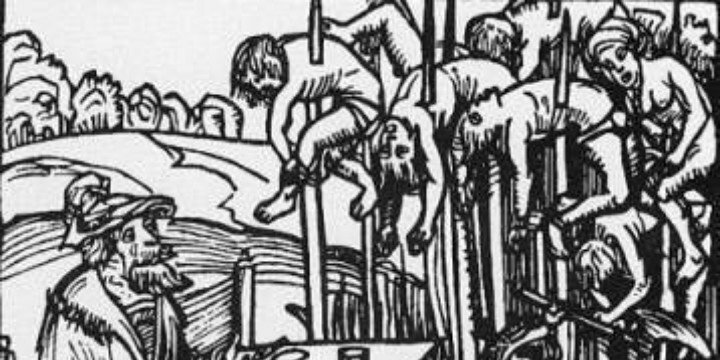 1499 German woodcut showing Vlad III dining among the impaled corpses of his victims. The sultan’s army entered into the area of the impalements, which was seventeen stades long and seven stades wide. There were large stakes there on which, as it was said, about twenty thousand men, women, and children had been splitted, quite a sight for the Turks and the sultan himself. The sultan was seized with amazement and said that it was not possible to deprive of his country a man who had done such great deeds, who had such a diabolical understanding of how to govern his realm and its people. And he said that a man who had done such things was worth much. The rest of the Turks were dumbfounded when they saw the multitude of men on the stakes. There were infants too affixed to their mothers on the stakes, and birds had made their nests in their entrails. The Wallachian nobles and army soon abandoned Vlad, and Radu became the new ruler of Wallachia. Meanwhile, Vlad had gone to Hungary to find support, but instead was arrested and put on trial by King Matthias Corvinus for killing Hungarians years earlier. Vlad would remain in prison for about eight years. It was not until 1476 that Vlad was able to reconquer Wallachia, but that reign would last only two months before he died. Vlad III Dracula and his brutal rule over Wallachia would become the stuff of legends and folk tales, and in 1897 was the inspiration for Bram Stoker’s novel Dracula. The Histories, by Laonikos Chalkokondyles, is translated by Anthony Kaldellis and is part of the Dumbarton Oaks Medieval Library. Click here to learn about this two-volume book from Harvard University Press.